Starting from the fundamentals of brakes and braking, Braking of Road Vehicles covers car and commercial vehicle applications and developments from both a theoretical and practical standpoint. Drawing on insights from leading experts from across the automotive industry, experienced industry course leader Andrew Day has developed a new handbook for automotive engineers needing an introduction to or refresh on this complex and critical topic. 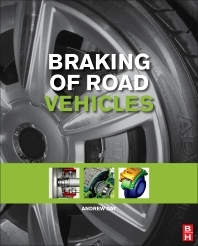 With coverage broad enough to appeal to general vehicle engineers and detailed enough to inform those with specialist brake interests, Braking of Road Vehicles is a reliable, no-nonsense guide for automotive professionals working within OEMs, suppliers and legislative organizations. Designed to meet the needs of working automotive engineers who require a comprehensive introduction to road vehicle brakes and braking systems. Offers practical, no-nonsense coverage, beginning with the fundamentals and moving on to cover specific technologies, applications and legislative details. Provides all the necessary information for specialists and non-specialists to keep up to date with relevant changes and advances in the area. Automotive engineers involved with brake system design, development, installation or testing; Graduate students on automotive/mechanical design courses covering brake system design. Andrew Day is the former Dean of the School of Engineering, Design, and Technology, at the University of Bradford, UK and course leader of the university’s well-known Braking of Road Vehicles course (widely referred to as ‘The Braking Course’) for engineers in industry. It is very helpful to understand all the concepts to analyze and calculate the brake system for different type of vehicles.